The DOGG BOSS Zipp-n-Go leash allows me to walk my 90lb dog instead of her walking me. I've tried choke and pinch choke and pinch collars along with numerous leashes that were a hassle to put on and take off and she still walked me. 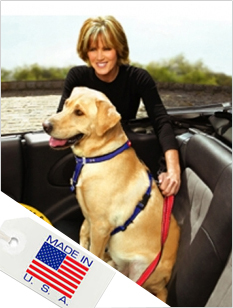 My dog, Roxy, and I are much more comfortable using the Zipp-n-Go leash. It is extremely easy to use, just slip it over her head and we are good to go! We have about 10 leashes but this is the only one we use now. It is strong, well made, and affordable (Cheaper that many others I have bought). They are available in many colors, I chose pink of course! I would definitely recommend this product to any dog owner! The Zipp-n-Go is so effective and safe, and we have one for each of our Labs. 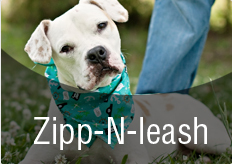 Putting a leash on a rambunctious puppy was so challenging, but with the Zipp-n-Go, she slips her head through the adjustable collar and with a gentle pull she's ready to go. I can now walk both of my dogs easily and have the control I need. Traditional leashes are a thing of the past. Great product! Would never go back to any other dog lead! I have a very strong pit bull and when using any other lead, he always lead me. After using the Zipp-n-go I am now in control. The Zipp-n-go along with training by Jeff allows me to once again have a peaceful enjoyable home. I can't thank you enough! Effectively Lead Your Dog with the Slip-N-Go! After trying choke collars, the gentle leader, treats, and many other methods to gain control of our excited dog, we found the slip-n-go to be the most effective leash/ collar combination. Ironically, our alpha-female dog wags her tail at this site of this leash even though it allows us to be in control. When combining the Zipp-n-go with appropriate leadership training, you will be able to effectively train your dog. We love the Zipp and go. It is lightweight, easy to use, and works great. We have one for each of our dogs and it has made walking our dogs so much more enjoyable. The thing we like the best is it does not pull on the dogs throat and there is no snapping a lease to a collar. I love this dog leash. It's extremely easy to use. Before, I owned a choke collar for my dog, but now I have the Zipp n' go! It doesn't harm my dog and is great for training. I highly recommend it. This is the easiest to use pet product I have ever owned. When it is time to go outside, our Husky sits by the door and when I hold out the Zipp-n-Go he just puts his head through the loop and away we go. No more fumbling with bolt-snaps and trying to find loops on collars! Plus it gives you the ability to correct your dog effectively without hurting him/her. Just a little tug and your dog will respond. If your dog is ornery they cannot back out or pull out of this. My whole family has now converted!!! The Zipp-n-Go is a wonderful product for working with a very energetic Jack Russell Terrior. I have used numerous different colars but non have provided the ease of use the Zipp-n-Go provides. Where other colars have slipped or choked our dog this product has worked great. It stays on Max, doesn't choke and is great for training. I'm no longer chasing Max around because he has slipped out of his colar. This is the BEST leash I have ever used! This product is an engineering marvel. I have used it for six months so far. My dog has been trained using this leash and it was a tremendous help. I was always hesitant to use "choker" type collars. The Zipp-n-Go does not sufficate the dog. I would recommend this leash to anyone with a dog. A Custom Fit Without Choking! I absolutely love my Zipp-N-Go lead. Finally a solution to the dangers of having your dog's collar too loose or too tight. My dog loves to wriggle his head out of his collar, but I've always worried about tightening it too much. And while choke collars may solve that problem, they create others...like choking! The Zipp-N-Go is the safe solution. Your dog won't be able to pull his head back out of it, yet he will be comfortable. My old leash is a thing of the past! My wife and I absolutely love the slip-n-gos we use for our dogs. Our two dogs have become much more responsive and attentive since we incorporated the slip-n-go into our training routines. They are handy for non-training use as well. You can attach/detach the slip-n-go much easier than the traditional leash. Our old leashes have been thrown in the storage bin! This leash is very easy to put on my dogs, not to mention take off. My favorite thing is when I put both of my dogs in the crate in the car, it is very easy to remove and I don't have to spend time messing with the regular clip that is on leashes. My dog, Sammy, was a pro at slipping out of his collar while on a leash, but he has not figured out a way to get out of the Zipp n Go. My dogs respond very well with the Zipp n Go! I love this leash! It's very user friendly and I have more control with my dog. I recommend this product for pet owners who are in the process of training their pets or for walking.